We are now recruiting bright, lively and enthusiastic individuals to join our team for the remainder of 2019. 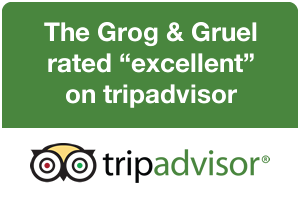 The Grog & Gruel is a relatively small but busy town centre pub and restaurant, and has been at the centre of food and drink in Fort William for the last 25 years. The Alehouse is open daily and in addition to the usual drinks service, food is also served in the bar throughout the day and evening. The restaurant opens in the evenings only, usually from 5pm till 10pm. We’re looking for Front of House staff to help us keep the show on the road for another season. General duties are broadly those to be expected in running such a food and drink operation. Full time hours are usually spread over a 5-day working week based on 40 hours, however, it isn’t unusual for more hours to be available, particularly during peak periods. Some split shifts and weekend working will be required, although we make every effort to prepare rosters to suit individual requirements. We always provide one clear day of rest each week. We can also consider applications for part time hours for both bar and restaurant positions, and may extend contracts to full time, year round. Staff uniform and taxis after late shifts for those living outside the town centre may be provided. It’s an old cliché but we strongly believe that enthusiasm and experience are as valuable an asset as previous experience. The fact that most of our senior and management positions her in Fort William and at our Glencoe business are occupied by one time General Assistants demonstrates our brief in the principle and our belief in our staff. Rates of pay start at the current National Minimum Wage and include a share of tips received in service plus uniform provided free on loan.